Back in November, I posted my answers to a series of questions that a high school student asked me for a project on Norse mythology and Norse religion that he was working on for his English class. I've now answered another set of questions on the topic – this time for a middle school student's English project. Tanner Lettieri is an eighth-grade student in Mr. Bradley Akans' Language Arts class at Algonquin Middle School in Clinton Township, Michigan. Tanner chose "Norse Mythology and Viking Culture" as the topic for his project, and – since Mr. Akans required his students to interview someone with knowledge of their chosen subject – he sent me a very nice email asking me to help. Tanner's questions are incredibly insightful and sophisticated. He's a very impressive eighth grader! Below are his questions and my answers. 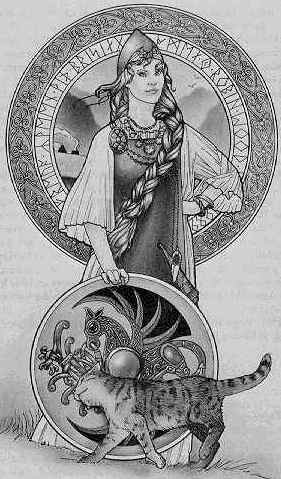 TL – Norse mythology includes many different gods and goddesses. How many are there, and do they have control over every aspect of life, or are there parts that not even the gods could control? 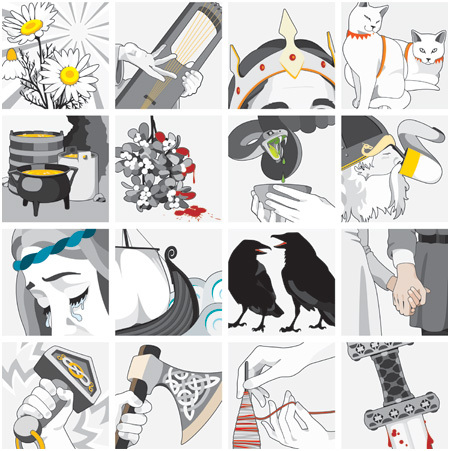 from their attributes in this artwork by Sól Hrafnsdóttir? 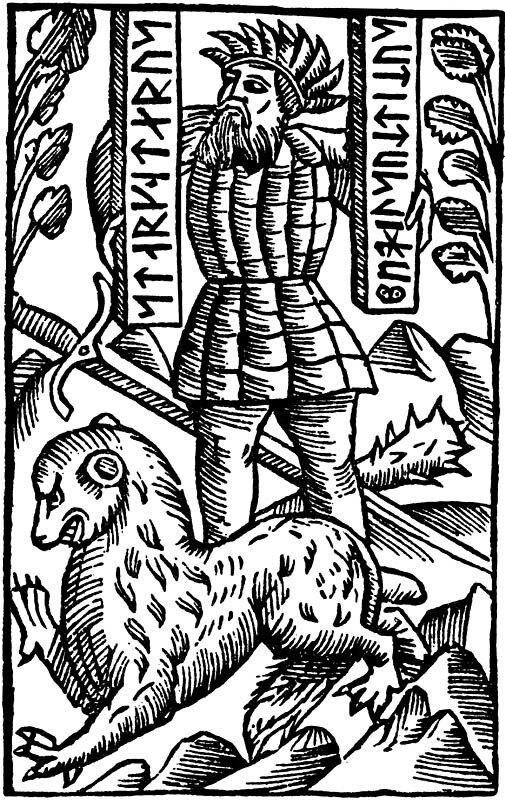 KS – In the book known as the Edda, the 13th-century Icelandic writer Snorri Sturluson lists the main gods as Odin, Thor, Njörð, Frey, Týr, Heimdall, Bragi, Vídar, Váli, Ull, Hœnir, Forseti and Loki. He does, however, say that Loki is only “numbered among the Æsir,” so his status as a god is a bit suspect. 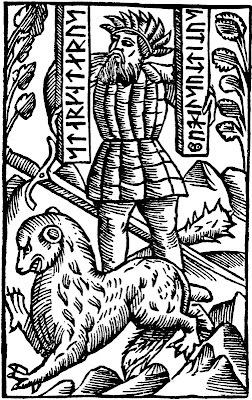 Snorri lists the main goddesses (Ásynjur) as Frigg, Freya, Gefjon, Idun, Gerd, Sigyn, Fulla, Nanna, Sága, Eir, Lofn, Vár, Vör, Hlín, Snotra, Gná and Sól; he neglects to mention Thor’s wife Sif and the icy maiden Skadi. Like Loki, Skadi is (temporarily) aligned with the gods – she’s actually a giant-maiden associated with mountains, skiing and archery. There are, as you said, many figures (even beyond what I’ve listed here), but some of them don’t really have developed characters or stories associated with them. In fact, some scholars argue that these lesser gods and goddesses may merely be aspects of the better-known gods that have “branched off” into separate entities. I don’t know if I would use the word control when talking of the gods' relationship to the various aspects of life. I think a better word might be influence. The gods are definitely involved in all aspects of life – birth, death, love, war, creativity, wealth, power, etc – but their contact with humanity is much more interactive and interesting than simple control. The Norse gods are very different from the god of the Old Testament, who demands obedience and adherence to his commandments, and who (for example) smites you with lightning if you accidentally bump into the Ark of the Covenant. In the Old Norse worldview, the gods were actors on the stage of life, not all-powerful directors. If you ever have to carry the Ark of the Covenant, please be careful! Possibly the strongest evidence for the Norse gods not controlling life is the fact that they themselves can die – that they are subject to the decrees of the Norns, the three mystic women who spin the fates of all living things. The gods (especially Odin) may mightily struggle against destiny, but they do not control it. TL – Throughout all the sources I’ve looked through while working on my project, most have told me that information on the Norse religion is scarce and hard to find, due to the lack of writing used in Viking culture. How lacking is this info? KS – There actually is a lot of information, and our body of knowledge is continually growing. New archaeological finds occur fairly regularly, and each discovery adds another piece to the puzzle of our understanding of this ancient culture. Linguists and philologists work to reconstruct long-lost language-forms and dialects. Historians study primary sources written by Greek and Roman authors for their descriptions of the Germanic and Nordic traditions of their times. Literary scholars pour over the Eddas and sagas of Iceland and try to piece together a coherent picture of the mythology and religion. You are right, however, about the lack of written sources from the actual believers in the ancient faith. Most of our written records come from well after the conversion to Christianity, when the new religion brought the traditions of Latin learning and writing with it as it moved into northern Europe. We really have a collection of second- or third-hand descriptions of religious practice that were written down by (at best) interested non-believers or (at worst) individuals who were actively hostile to the Old Way. Today, there is a vast body of scholarship on all aspects of Norse history and religion. However, it’s very difficult to find reliable information on the Internet, which tends to be dominated by superficial, non-scholarly material. If you have access to a university library – or a good public library – you will find a whole world of books waiting for you on these subjects. TL – Why wasn’t the Runic writing system – the system said to be created by Odin himself in the old tales – not used to write down the legends that skalds told? The runic system was mainly used for carving in stone and wood. The tradition of writing on parchment with ink came in with the arrival of Christian learning. In pre-Christian times, poems and stories were preserved as oral tradition. A story from Gautrek’s Saga underscores the importance of memory for the poet-storyteller. Odin, disguised as Grani Horsehair (grani means “moustache”), takes the hero Starkad to a meeting of the gods. Thor is mad at Starkad, since the hero’s mother chose a giant for a mate instead of the Thunder God. Whatever gift Odin gives the hero, Thor cancels out. Then just about midnight, Grani Horsehair woke up his foster-son Starkad and asked him to come along with him. They got a small boat and rowed over to another island. They walked through a wood until they came to a clearing where a large number of people were attending a meeting. There were eleven men sitting on chairs but a twelfth chair was empty. Starkad and his foster-father joined the assembly, and Grani Horsehair seated himself on the twelfth chair. Everyone present greeted him by the name Odin, and he said that the judges would now have to decide on Starkad's fate. Then the judges decreed that all that had been said should happen to Starkad. The assembly broke up, and Grani Horse-hair and Starkad went back to their boat. 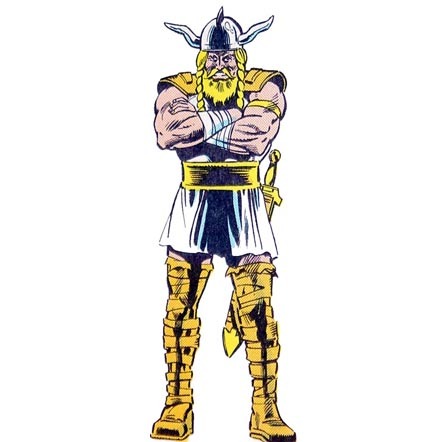 Odin, the god of poetic inspiration, gives Starkad the ability to compose poetry on the spot, like a freestyle rapper. Thor makes the gift useless by decreeing that Starkad won’t be able to remember what he composes after he speaks it. In an age when the written word was still uncommon, this meant that Starkad’s poetry would be instantly lost. From this tale, you can see that simply being creative wasn’t enough; you had to remember what you had composed, too! right hand gives the Latin version of his name. TL – Do the stories told by the Norsemen affect our culture any great deal today without most people knowing? They do. When you study English literature in high school or college, you’ll find that one of the foundational works of Old English is Beowulf, which details both historical and legendary events in Denmark and other northern locales. 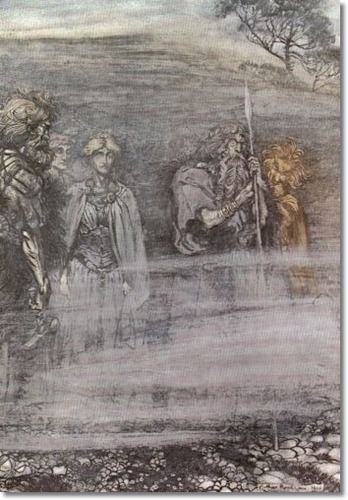 It preserves alternate versions of famous legends, including that of the great dragon-slayer Sigurd/Siegfried (although Beowulf switches the roles of Sigurd and his father, Sigmund). J.R.R. Tolkien was an expert on Old English and Old Norse literature, and his essay on Beowulf influenced the way that way study it in England and America to this day. Tolkien’s books of fantasy fiction (especially The Hobbit and The Lord of the Rings) are full of references to and retellings of Norse myth. How many people watching the Peter Jackson films understand these allusions? 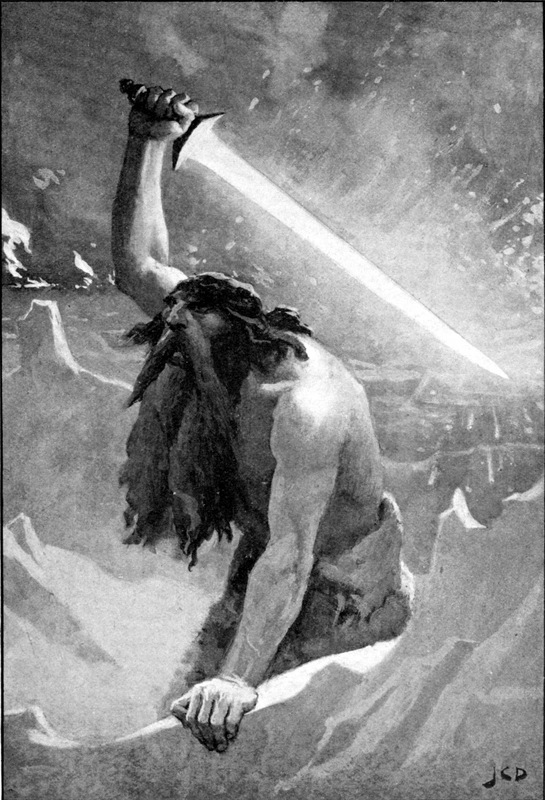 Many ideas from Norse mythology (magical runic inscriptions, mystical swords, wandering wizards) have simply become part of the fantasy genre, and their connection to Norse myth goes unnoticed by most people. 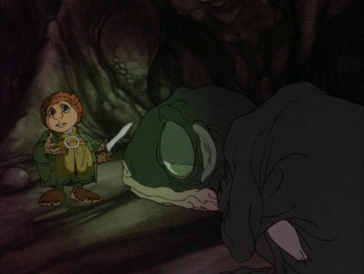 Bilbo Baggins and Gollum – come straight from Norse mythology. The concepts of the Old Way continue to influence politics, too. We developed a different system here in America, but many European nations (and countries where they have had influence) have a parliamentary system. The roots of this system can be traced back to the Þing (pronounced “thing”) of the ancient Germanic world. In Iceland, they actually still use this old name for their parliament. The Icelandic sagas contain many fascinating stories of debates (and sometimes actual fights) at these long-ago councils, and the myths tell us that even the gods held their own Þings. It’s fascinating that this system of government has survived and evolved over so great a time span. There are many other ways Norse myth still lives on around us. You can read about some of them in my article answering questions on Norse mythology and Norse religion from a high school student. TL – The Norse gods created several different worlds, each housing its own specific race. Were these separate worlds, or the races within them ever greatly detailed, or just vaguely referenced? KS – We know a lot about some of them, very little about others. The myths tell us about Asgard (home of the Æsir) in great detail – about the buildings, the inhabitants, the events that take place there. Thor has adventures in Jötunheim (home of the giants) and meets many of its monstrous inhabitants – he usually ends up smashing them with his mighty hammer. Humans live on Midgard, so you could say that all the sagas deal with this world. to agree on how to illustrate them. On the other hand, we know very little about Álfheim (home of the light-elves) and its inhabitants. We may think we know all about the elves, but most of our image of them comes from later folk tales and fantasy literature; the myths themselves tell us very little. The dwarves appear in the mythology and make treasures for their gods, but no female dwarves ever show up. I wonder if the dwarves spend so much time in their workshops because they can't find any girls to talk to . . . The poems, myths and sagas all suggest that ancient people had detailed ideas about the different races of beings. References are made to Álfablót (sacrifice to the elves), for instance. The poems collected in the Poetic Edda make shadowy references to stories that are now lost. It seems clear that there was once a more detailed conception of these different types of beings, but they haven’t survived in the written record that we have today. TL – Were the gods immortal like most gods in other religions? The gods who planned to fight with the forces of evil in Ragnarök – seemed to be able to die, so what made them higher then mere men? The gods are definitely not immortal, and they are not eternal – unlike the god of Christianity, Judaism and Islam, who has always existed. The myths tell us of the “birth” of the first god (he’s actually licked from salty ice by a magic cow) and of the deaths of Odin, Thor and the other major gods. They have both a beginning and an end. What enables the gods and goddesses to outlive mortals is their access to mystic apples of youth, harvested by the goddess Idun. As long as they take these sort-of super-vitamins, they stay young and strong. In one story, the giants kidnap Idun, and the gods age and wither until they get her (and her magic apples) back. The gods fade away without their magic apples. The gods are higher than humans in the same way that humans are higher than hamsters; they’re simply a higher order of being. The gods are older and wiser, they are more powerful and stronger, and they have access to all sorts of wondrous things that you and I couldn’t really handle – Thor’s hammer, Odin’s eight-legged horse, Freya’s falcon cloak and so on. One way to think of the gods is as personifications of powerful natural forces. In fact, one of the old terms for the gods is regin, which means “powers.” You and I are just people, but some of the gods’ names show their very different natures. Thor is “thunder,” Odin is “fury,” Jörð is “earth.” You could even see Frey (“lord”) and Freya (“lady”) as manhood and womanhood incarnate. TL – Are there any details on what creatures make up the horde of evil that will face off with the gods? Loki and his offspring are main contributors, but who else? KS – The Edda and Poetic Edda both provide details about the forces of darkness that will fight the gods in the final battle at Ragnarök. Loki, Hel, Fenrir and Jörmungand will be joined by an army of evil dead and a host of monstrous giants. Surt will raise his flaming sword to lead giants from Muspell, the land of fire to the south. Hrym will lead the giants from the east, raising his shield before him. The monstrous hound named Garm will break free from his bonds and join the attack. All of the Nine Worlds seem to be involved in the battle, but the allegiances of the different groups aren’t completely spelled out. One of the main poems in the Poetic Edda tells us that “the dwarfs howl before their rocky doors,” but it doesn’t tell us whose side they’re on. Surt had a flaming sword before Darth Vader had a lightsaber. TL – Why are the Æsir and Vanir gods so different from one another, and why did the Æsir receive more attention from followers of the religion? Generally speaking, the Æsir are gods of rulership and war, and the Vanir of fertility. However, their roles tend to overlap. There is historical evidence that Thor was invoked in battle, but he was also seen as the patron of the independent farmer; you can see that this reflects both the destructive power of lightning and the fertile power of the rain that it brings. At the beginning of this interview, you asked if the gods “have control over every aspect of life.” Together, the two tribes of gods are involved in the totality of existence. Neither group by itself is enough; they need each other to complete the circle. For example, Freya brings knowledge of magical practice from the Vanir to the Æsir. Odin learns this wisdom, and goes on to become a sort of wizard-priest and master of magic. So, is magical knowledge a trait of the Vanir or the Æsir? Although Freya is one of the Vanir – and can be seen, in part, as a goddess of fertility and love – she lives with the Æsir in Asgard and divides with Odin the warriors who die in battle. The two tribes of gods have a very complicated partnership. Freya was a sorceress before Odin was a wizard. I’m not sure that I would say the Æsir received more attention from the followers of the old religion. Odin looms large in the poetry that has survived, but you have to remember that he was the god who inspired poets. It makes sense that they would dedicate their poems to him. If we could go back in time and interview old-time farmers, they might tell us a great number of forgotten tales of Thor. As a matter of fact, historical sources tell us that the ancient temple at Uppsala in Sweden had a huge statue of Thor in the middle; Odin and Frey were placed off to the side. We also know that Frey himself had very devoted followers in both Sweden and Iceland. My point is that different gods were given varying degrees of importance in different locales. Snorri Sturluson’s Edda tells us that women prayed to specific goddesses for specific needs. Earlier, I mentioned the Álfablót (sacrifice to the elves). The elves – mysterious as they are – are associated with the Vanir in the mythology. Frey, one of the most important of the Vanir, lives in Álfheim (home of the elves). As with so much of this material, we seem to be missing some important pieces of the puzzle here. Like we did in the case of Odin and the poets, we should consider who eventually wrote down the myths. If women writers were the ones preserving the records of mythology and religion, we might have a very different idea of the whole subject – perhaps with a greater emphasis on the Vanir. It’s also important to consider our own contemporary perspective. I grew up reading Thor comics, not Frey comics. It’s a lot easier to write adventure tales about a violent god of thunder than about a peaceful god of fertility. Which would you rather read? Our own interests can shape our view of the material, and we need to be careful not to project our own attitudes onto a complicated group of people that lived over a thousand years ago, and who had a very complex relationship with this ancient religion. but it seems like Marvel Comics wasn't sure what to do with him. I would like to thank you for asking me to be part of your school project. Your questions are very insightful and sophisticated. Many of the issues that you raise are the same ones that I discuss with students in my Norse religion college classes. You’re way ahead of the game in your thinking on these issues, and I am curious to see how your studies progress. Please keep me posted! The non-facile treatment of the Norse gods is a boon to readers! I can only lament, however, the shallow depiction of the god of the Old Testament, who surely deserves just as much respect as do the Norse figures. The fact that many people think that they are quite familiar with the God of the Old Testament is no more reason to give an off-the-cuff and inaccurate depiction than would the presence of the movie "Thor" be a reason to neglect a thorough discussion of the Norse heritage. 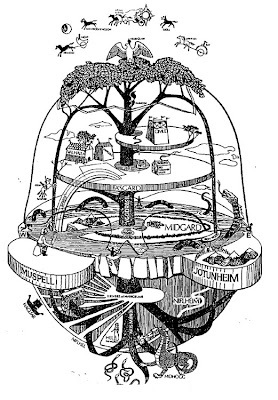 I recognize that this is a site about the Norse gods, not the Jewish God, but it might have been more helpful to direct your readers to the passages of the OT where God's universal lordship is discussed in terms of his care for all things (i.e. Isaiah 40, Genesis 1, Psalm 112) rather than an off-hand reference to smiting, which really does nothing to illuminate the issue, since the Norse gods--despite their omnipotence--can and do engage in a fair bit of smiting themselves! Thank you very much for your comment and for your kind words. I have to politely and respectfully disagree, however! My comment on the Old Testament God is an accurate depiction that does illuminate the issue I was discussing. 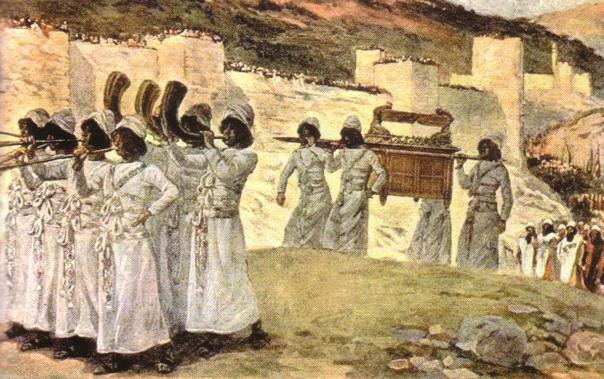 Here's the actual passage from 2 Samuel 6: "When they came to the threshing floor of Nakon, Uzzah reached out and took hold of the ark of God, because the oxen stumbled. The Lord's anger burned against Uzzah because of his irreverent act; therefore God struck him down, and he died there beside the ark of God." This is a perfect example of the OTG killing someone for breaking one of his rules - even though Uzzah simply tripped and bumped into the Ark. If everything that happens is God's will, didn't God make the oxen stumble? It seems like poor Uzzah was treated a bit unfairly. As a child, this was the passage in the Old Testament that most terrified me. If I unintentionally and accidentally broke one of God's (many) rules, he would blast me with lightning? That's pretty scary. As I wrote in the article, Old Norse gods did not issue these sorts of unilateral and literal laws. Hávamál ("Sayings of the High One") gives the words of Odin; they are not commandments, but aphorisms of folk wisdom and a sharing of Odin's experiences that invite the reader/listener to draw his or her own conclusions. Odin is not at all omnipotent, as you say. The Norse gods are flawed and fallible, not all-powerful or all-knowing. I don't think it's fair to compare God's smiting of his human worshipers with the smiting done by the Norse gods. Thor (the god who does almost all of the literal smiting in the myths) attacks giants, witches and berserks - the enemies of humanity. I can't think of a single example where Thor hammers one of his own human followers. It's just not in his nature. Even when little Thjalfi breaks Thor's simple and easy-to-follow instruction not to break the bones of his mystic goats while eating their meat (long story), Thor is quick to forgive him - and actually brings him along on subsequent adventures as a sort-of Robin to Thor's Batman. That's a far cry from blasting poor Uzzah to a greasy spot in the sand! 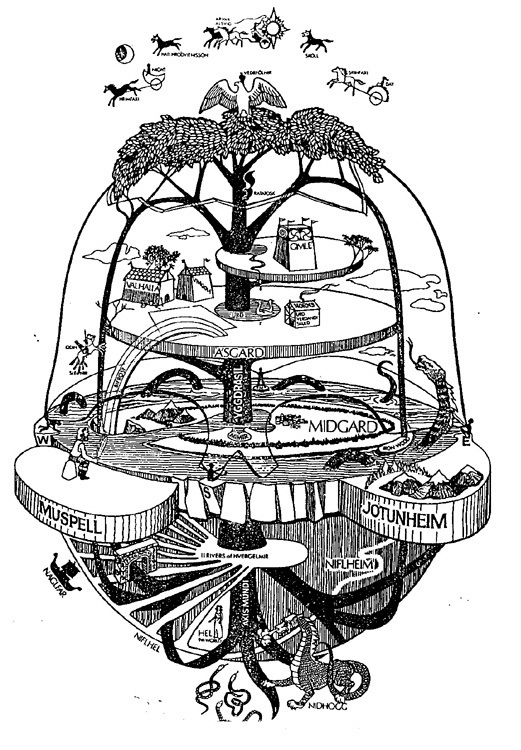 This weblog is the best source of Germanic/Norse mythology and religion I have seen so far. Very informing and easy to read! Thank you for creating this website. Given the obvious role of these gods in the names of our days of the week, we should know much more about them. You write very well for a heathen. Ooops, that didn't come out right.